We're Back April 26th, 2019! Fill out our job application located on our Contact page and email it to us along with your resume! We're hiring for all positions! 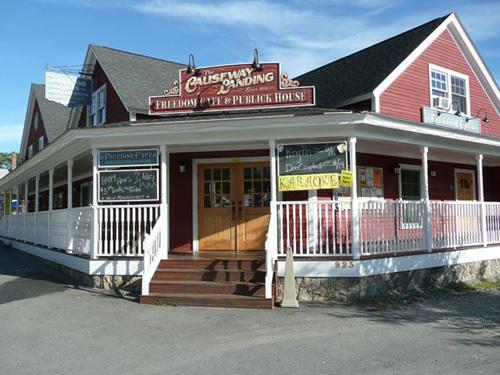 Our restaurant and pub are in a beautiful 200-year-old post & beam building located on the shores of Long Lake (on the Causeway) in Naples, Maine. We offer waterfront dining both indoors and out during the spring, summer and fall months and private parties can be catered in any of our four rooms. Functions and parties of 10-150 people can be accommodated and will fit any budget. Our extensive menu includes appetizers, salads, seafood, burgers, sandwiches, and desserts. A rich selection of wines are available both by the bottle and the glass and you must try one of our specialty cocktails. A full bar is available not only for dinner but for special occasions and functions. View Patriot, Red Sox and Bruin sporting events on one of our 6 flat screen TV’s or join us this summer at the weekly Beach Party every Saturday featuring reggae, drinks and more!